While having a romp with his children at his home on Flora avenue Saturday morning, Mayor Crittenden sprained a ligament in the big toe of his right foot. During the day the mayor went about his official duties, although he suffered a great deal of pain. Yesterday the whole foot became swollen and inflamed, and his physicians ordered him to take absolute rest for a few days. The mayor carries an accident policy. "Elizabeth," the canary that had a record of raising a family of eighteen birds since April 15 last, and which always attracted so much attention because it was given its freedom in the city hall offices of Tom Gregory, auditor of the water department, was accidentally killed yesterday. The little warbler was perched on top of a door when a sudden gust of wind closed the door. The bird was caught in the jam of the door case, and its life crushed out. Mr. Gregory and his office force are inconsolable. Charles Cole and Earl Sheirel, aged 12 and 13 years, were run down yesterday by a combination hose and chemical fire automobile at Armstrong avenue and Seventeenth street in Kansas City, Kas., and received injuries which may result fatally in the case of the little Cole boy. The boys were seated on a small coasting wagon, riding north on Seventeenth street, which has a gradual slope for several blocks. The fire automobile, which has recently been undergoing tests in Kansas City, Kas., with the prospect of being purchased by the city, was going the same direction, being driven by S. O. Harpster. Stories of the collision which occurred between Ann and Armstrong avenues, differ. The Cole boy was seated on the rear of the little wagon and the heavy fire wagon passed entirely over his body, rolling along the asphalt pavement. The Sheirel boy was thrown to one side and a wheel of the wagon crushed a thumb on the right hand. Following the accident the occupants of the motor wagon picked up the unconscious boy and removed him to the home of his father, J. B. Cole, 1604 Minnesota avenue. The Sheirel boy, who lives at 1606 Minnesota avenue, refused to ride in the wagon, and walked to his home, where he was treated by Dr. W. H. McLeod. S. O. Harpster, a representative of the Anderson Coupling and Fire Supply Company, A. Zertman, of the Zertman-Tiller Motor Car Company, and a Mr. Lamb, of Bowling Green, Ohio, the occupants of the car stated that they were in no way to blame for the accident. "We were several blocks behind the boys when we first saw them," said Mr. Harpster. "I had intended to turn east on Armstrong avenue and had the car going about five miles an hour and under perfect control. We were ringing the bell constantly. When we neared the boys I started to pass them on the right side. They turned to the right and then when I turned to the left they appeared to become confused and as we started to pass they ran into us. I stopped within a car length of where we struck the boys." This version of the accident differs materially from that told by eye witnesses to the accident. Mrs. R. Carpenter of 1619 Armstrong avenue said yesterday that the automobile was traveling at a high rate of speed. "I tried to warn the boys, but the rattle of their wagon drowned my voice," she said. "It seemed to me that the automobile just ran right into them. The car ran at least 100 feet beyond the place where the boys were struck before it was stopped. The little coasting wagon was broken into small pieces." A number of laborers who were working near the scene of the accident examined the tracks of the car and the little wagon, and they stated yesterday that the coasting wagon was within eight feet of the left-hand curbing when it was struck. Dr. W. R. Palmer, who attended the injured boy, stated last night that his condition was serious. He sustained a broken collar bone, a possible concussion of the brain and severe cuts and bruises over his head and body. One particularly painful bruise is over the spine. J. B. Cole, father of the injured boy, is bailiff of the Wyandotte county court. GREY EAGLE INJURED IN RACE. Wheel of Kansas City Boat. NATCHEZ, MISS., Oct. 29. -- With Speaker Joe Cannon, two score congressmen and several senators leaning over the railing waving their hats and cheering like a crowd of college boys at a football game, the steamers Quincy and Grey Eagle of the Taft flotilla raced for more than a mile coming out of Vicksburg last night. The contest ended when the Quincy crashed into the Grey Eagle, crushing the wheel. The damaged boat managed to make her way to Natchez, where carpenters made the necessary repairs. The Grey Eagle is carrying the Kansas City, Mo., river boomers to the New Orleans convention. When the boats crashed, passengers on both were hurled to the deck. No one was injured, however. The Quincy and Grey Eagle have been speed rivals during the entire trip. Clyde Bailey, a carpenter, and a bridegroom of two months, who lived with his father-in-law, Andrew Curtis, 2811 Bales avenue, was killed by a southbound Indiana car between Eighteenth and Nineteenth streets at 6:18 o'clock last evening. Young Bailey, who was only 19 years old, had been working all day with his father and brother on a building at Overland park, and at 5:30 in the evening left them at Thirty-ninth and State line with the words: "Well I'll see you in the morning, kid." He changed cars at that point and eventually transferred to the Indiana avenue car which would take him to his home and supper. Charles L. Bowman, proprietor of a night lunch wagon at Eighteenth and Indiana, who was a passenger on the car with Bailey, said they got off at Eighteenth. Bailey walked south on Indiana to the center of the block, said Bowman, and seeing a northbound car coming, crossed the west track and tried to catch the car on the inside. He was thrown back on the west track in the path from the southbound car from which he had just stepped and which by that time was going very rapidly. 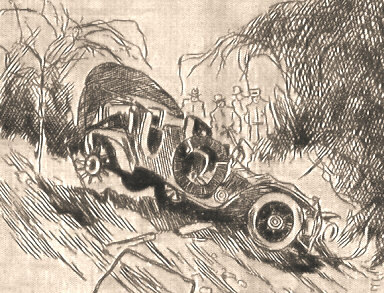 the top of Bailey's head struck the inside rail of the west track and was crushed by the wheels, the motorman being unable to stop the car until it had entirely passed over the body. 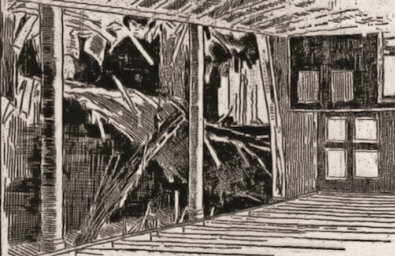 Fifteen minutes after the accident Deputy Coroner Harry Czarlinsky had the body removed to the Carrol-Davidson undertaking rooms, where it was identified by a book of Overland Park line tickets which he had purchased yesterday morning. His father, Nathan H. Bailey, 4435 Madison street, was notified, and his son, Cal W. Bailey, a brother of Clyde, was the first to arrive at the undertaking rooms. The streetcar conductor, Jerome Moore, 835 Ann avenue, Kansas City, Kas., and the motorman, William Erickson of 1049 Ann avenue, were arrested by Officer Fields and taken to police headquarters where Assistant Prosecuting Attorney Norman Woodson released them on their personal recognizance for their appearance this morning. It was at first thought Bailey was Roland Allshire, son of Roy B. Allshire, a contractor living at 2421 Indiana avenue, as Bailey had one of Allshire's cards in his pocket. A verdant young man immediately repaired to the Allshire home, where he threw the family into hysterics with the news. They telephoned to the Loose-Wiles factory, where young Allshire works nights, and he soon appeared on the scene to contradict the story. Leading behind his wagon a fine bull which he had purchased at the stock sale at the yards yesterday afternoon, G. W. Mercer of Independence was slowly toiling up the Allen avenue viaduct when a big motor car of the unfortunate color of red attempted to pass the cavalcade. As soon as his bovineship caught sight of the carmine car there was a vigorous shaking of the head, a kicking of the heels. In his frantic efforts to get at the strange and wonderful thing, the bull got in the path of the car. There was immediately a mixup of auto, bull and wagon. When the dust cleared away the bull was found to be down on his back, badly tangled up in the wheels of the wagon. The motor car was uninjured. Mr. Mercer reported to the police that he would prosecute the driver. ONE WAY TO "DUCK" SAMPLES. While Mrs. Edith Sampson was sweeping the front porch at 510 Olive street yesterday morning about 9 o'clock, she saw a distributor of samples approaching. Intent on her task, she gave the broom two or three more vigorous turns, then looked up again expecting to be handed a sample. no man was in sight. She looked further and found a hole in the front walk where the man should have been standing. Closer inspection revealed the sample man himself at the bottom of the hole, well covered with pulverized concrete. Several of the hexagonal blocks of which the walk is made up, had given way beneath his weight and precipitated him into the cellar which projects under the walk. The man made his exit by way of the cellar steps, not badly hurt. HORSE TAMES A HORSE TAMER. Duke Lee, former soldier, Kansas City policeman and rough rider, is in Kansas City again, recuperating from injuries which he received in Grand Rapids, Mich., two weeks ago while attempting to tame a broncho in a Wild West show, with which he has been traveling. Lee was thrown and trampled upon by the vicious animal. He suffered two broken ribs and a dislocated collar bone. "I can't explain how it happened," Lee said yesterday. "The show keeps wild horses instead of trained ones and it is a real fight in the arena that the crowd is watching." Lee resigned from the police department in the spring. He served in the regular army and was in the Boxer insurrection in China before his appointment to the force. of It Two Weeks Ago. The one-year-old son of Mr. and Mrs. J. S. Trestrail of 2919 Indiana avenue, who fell into a dishpan of boiling starch two weeks ago, and was severly burned, died yesterday morning. The funeral was held from the reisdence yesterday afternoon. Burial was in Elmwood cemetery. WABASH PASSENGER TRAIN SLIDES INTO THE RIVER. FOUR KNOWN TO BE DEAD AND 30 INJURED. Embankment Undermined by Missouri River, Near Orrick, and East Bound Train Slid Into the Water --- Trainmen Buried Under their Engine -- Passengers Reported Missing. A washout made by the recent floods which had washed away practically all the support of the tracks, caused a part of Wabash train No. 4, out of Kansas City, to plunge into the Missouri river at Hull's Point, Mo., two miles east of Orrick about 10:15 o'clock last night. Orrick is thirty miles east of Kansas City. Four are known to be dead and thirty-nine injured, some seriously. The engine, baggage and express cars are in the river, almost entirely covered by water and the bodies of the engineer and fireman, a baggageman and a baby are buried in the wreckage. The train consisting of engine and nine coaches left Kansas City for St. Louis at 9 o'clock last night in charge of Conductor W. M. Frye of St. Louis. There were four sleepers on the train, one of them for Des Moines and according to Conductor Frye's story he carried sixty-eight passengers. In the baggage and express car was Harry Eckhert, Pacific express messenger, who had charge of between $30,000 and $40,000 consigned to St. Louis. Immediately after the news of the wreck reached Kansas City a relief train was sent out and all of the injured were brought to Kansas City. The train bearing the injured and other passengers arrived at the Union depot at 2:30 o'clock this morning. Seven ambulances with surgeons were in waiting and the injured were given temporary treatment in the main waiting room before being taken to the hospitals. An hour after the wrecked passengers reached Kansas City, a new train was secured and the uninjured passengers were sent on to their destination. The train was running at 35 miles an hour when it reached the line of track, a quarter of a mile in extent, which had been undermined and washed away by the Missouri river. Into this space the train suddenly plunged, though passengers say that they felt the shock of the grinding brakes. At the point where the derailment occurred the track is practically straight and the river makes no perceptible curve. The river had eaten its way fifty feet beyond the inmost rail so no vestige of track remained visible. When the engine struck the water it hurled itself forward carrying the baggage and mail car and sleeper with it. The baggage car crashed on top of the engine and the two were forced beneath the water, the engine being completely submerged and the baggage car standing on end in the water. The mail car overturned in the water and the clerks were forced to climb over the wreckage before they could get to safety. Every one of them was injured in some degree by the force of the shock. The washout occurred after 6:30 o'clock, for at that time another Wabash passenger train, eastbound, went over the track in safety and no danger was noticed. DIED AT POST OF DUTY. Engineer Flowers and Fireman Bond both went into the river with their engine and were drowned. It is thought that the escaping steam would have scalded them to death even had they not been held under the water by the weight of the engine. Baggageman Harry Eckert was caught in his car which sank to the bottom of the stream and he was drowned like a rat in a trap. The death of little Donald King, the infant who was thrown from his father's arms into the river, was particularly sad. The child was but 2 years old and both parents were with him and his two little sisters, but little older than himself. Just before the train was precipitated into the river his father took him forward to the toilet room. When Mr. King got to the front of the coach the first shock came and he lurched heavily. The child was forced from his arms in some way and, it is thought, fell into the stream through one of the open windows. When the parents were seen at the Union depot last night they were both so dazed they could hardly give a coherent account of the accident. Ten or twelve people who were only slightly injured left the train at the scene of the accident and went back to Orrick, Mo. Their names could not be learned this morning. News of the wreck was not long in reaching the depot and long before the relief train arrived the platform resembled the ward of a hospital. Along track No. 1 on which the train was scheduled to come in, was a long line of cots, while emergency surgeons in shirt sleeves strolled up and down or sat on the cots awaiting the arrival. At about ten minutes past 2 o'clock there was a stir in the crowd of those waiting, the crowd having steadily increased as the news of the wreck filtered through the early morning air. A "flash" was received that the train had reached Randolph, just across the river, and would be at the station in ten minutes. Policemen showed up from apparently nowhere and took up their station along the track. Ten minutes, twenty, thirty minutes passed and when shortly after the half-hour the train backed in. The crowd was so dense it was with difficulty the police made a passageway for the surgeons and stretchers. LONG LINE OF WHITE COTS. Conductor Frye was the first man off the train. As soon as his lantern flashed its signal to the waiting hospital attendants, a line of white cots came into view, while the police had a difficult time keeping back the morbidly curious. "A man in the sleeper is badly hurt," said Frye. Men carried in a cot and because of the crowd it was necessary to pass the cot holding the injured man through a car window. Others were carried or helped out by trainmen, hospital attendants and uninjured passengers, some bleeding and dazed, with temporary bandages wrapped about heads, arms and bodies. Those who were able were left for the time being to shift for themselves, while surgeons bent over the cots of the more seriously injured to administer temporary relief. Meanwhile uninjured passengers besieged Frye to know when they could "go on." "Just as soon as we can get a train crew," was the invariable reply of the patient conductor. Dr. Robert Sheetz and Dr. G. O. Moore of Orrick were the first physicians on the scene. They impressed those of the passengers who were able to assist them and gave temporary relief to most of the injured by the time the train reached Kansas City. Miss Irene Dorton, 20, and Mrs. Sam Hackett, 40 years old, both of Orrick, were within a few miles of their home when the accident occurred. They had been visiting friends in Kansas City and were getting their luggage ready to get off the train when they were suddenly thrown out of their seats and across the aisle. Both lost consciousness and were revived by some of the passengers who were not as severely injured. They were attended by Drs. Sheet and Moore of Orrick. "I can't tell you a thing about how the accident happened," said Miss Dorton, who was hurt the least. "I remember saying something to Mrs. Hackett about getting off the train, but that is all." ONE OF THE WORST INJURED. Frank Gardner, 40 years old, of Mount Vernon, was one of the worst injured. His hand was gashed and his left arm was almost crushed off. He was in the forward car and was caught beneath the wreckage. "Our escape from death was simply miraculous," said Miss Mamie Donnelly of Mexico, Mo. "I was holding my little niece, Mary, 6 years old, in my lap, when suddenly a feeling passed through me similar to that one feels when riding a chute the chutes, then came a terrible jar and Mary was thrown clear out of my arms and her little head struck the roof of the car. I caught her dress and she fell back on me. We were both scratched a little but outside of the jar were not hurt." Mr. and Mrs. C. F. Moore of Pueblo, Col, who were on their way to Huntsville, Mo., were both hurt. Mrs. Moore was badly bruised and cut and her back was sprained. "We were in the chair car when the accident occurred," said Mr. Moore, "and we felt as if the earth just slipped out from beneath us. My wife was thrown against the side of the car and then into my arms. For a moment it felt as if we were to be engulfed and then all was still. Then came the cries for help. It seemed as if everyone was crying for help even though they were uninjured. Everyone was just panic stricken. I gathered my wife in my arms and we soon found ourselves outside the car. The scene was awful. The engine had bone beneath the river and was followed by several cars, we could not see how many. When I attended my wife's injuries I helped to look after the other passengers who were hurt." Z. T. Finney, the brakeman, was on the head end of the deadhead sleeper and was pitched far out into the Missouri river when the embankment gave way beneath the train. He was half buried beneath coal from the tender and was cut and bruised. The water restored him to consciousness and he swam to shore. "I was on the head end of the deadhead sleeper," said Brakeman Finey, "when the crash came. Just before we went into the water I felt the platform sort of sway and a sickening, falling sensation came over me. The next I remember I felt myself hurled over the top of the tender and then all was blank until I found myself swimming back to the train. The engine as it sank into the soft bank came to a sudden stop, and this jammed the cars together and threw me over the tender. That's how I happened to get hurt, although I am lucky that I was not carried beneath the cars." Finney's injuries, while severe, are not serious. "I'll never forget this night as long as I live," said Miss Birdie Dugan of 2829 St. Louis avenue, St. Louis, who was on the wrecked train. "It was terrible to see the injured as they were brought into our car, and to think of the others lying in the river. A man in our car lost his baby right out of his arms, and it went into the river. The poor mother was just a little distance away. There was an awful crash as the car broke in two, and the roof came down and the sides came together and caught so many people so they could not move. Everybody worked to get them out before the other half of the car fell into the river. The accident occurred shortly after 10 o'clock. We left Kansas City at 9 o'clock, right on time." Dr. Mary Turner Loahbeck of 2829 St. Louis avenue, St. Louis, Mo., was on the train, and assisted in aiding the injured. "About all that was possible for me to do was to bandage the cuts," the doctor said. "I had no bandages with me, but we secured twenty or thirty sheets from the sleeping cars, and tore them into bandages. I attended about twenty people myself. The people of Orrick, Mo., were very kind. They gave us dry underclothing for the persons who were wet, and offered us all the assistance they were able to render." Had it not been for the fact that the Wabash train No. 9, being the passenger train from Boston, was delayed at Moberly an hour, it would have met the fate of its sister train. If the train No. 9 had been on scheduled time it would have reached the washout before No. 4. Train No. 9 was due in Kansas City at 9:45, but arrived at 2:40, just after the relief train got into Kansas City. No. 9 was detoured over the Missouri Pacific after having been held for three hours by the wreck.